Well that was a feast for the eyes, wasn’t it? With no warning, we get dropped into a desert planet, where Kokona and Papika are separated. Comparisons between the first half of this episode and Mad Max: Fury Road are warranted and expected, but the better comparison would be to Fist of the North Star. There, our MC Kenshiro is similarly captured and jailed in a desert community, but a gang of biker punks come to create mayhem (as biker punks are want to do). Kenshiro is released by a little girl who feeds him and he protects the people from the unruly mob. Here, the same thing basically happens, except the little girl actually turns out to be the leader of the mob! And geez, what a leader she turns out to be. Here’s where the Fist of the North Star comparison starts to fall apart, because the palace where Kokona is captured and brainwashed is reminiscent of Shin’s palace, and yet Shin never had a fountain with scores of naked women bathing. Our villain also has a lot of questions for Kokona and the personality she’s repressing. So memorable, the sadistic, manipulative evildoer sipping a martini while being carried around by our robot friend Bu-chan is an image I’m not going to forget. But the comparisons don’t stop! We finally get our full magical girl transformations and they were a treat to watch too! Very reminiscent of Sailor Moon in fact. (That their hair color basically flips will be important and something to keep an eye on) Which then leads to a Dragon Ball Z-style fight between our nefarious villain, who herself transforms into a hellish fiend, and our magical duo. Planetary orbits, giant guns that shoot bubbles, the works come out this week. And yet it’s not enough until a new group comes out of left field. Yayaka, Kokona’s childhood friend comes from outta nowhere with silver haired twins to ultimately destroy the fell beast in record time. They’re after fragments too, which they call “amorphous”, and work for a completely different organization, Asclepius. In Greek mythology, Asclepius is the god of medicine and healing. The ruler/leader of this dimension also feeds the fragment into something that looks remarkably like the Rod of Asclepius, which is featured in nearly every image for any major health organization today. It’s pretty clear that Asclepius is a pretty sterile, empty place which will be important, I’m sure. So what happens now? Maybe Dr. Salt isn’t as evil as I initially judged him, since we now have the Asclepius people who seem more terrible. Maybe he’s a failed leader ala Lord Genome of Gurren Lagann, who tried to rebel against Asclepius/Anti-Spirals and came up short. We’ll have to find out soon, because Flip Flappers isn’t interested in illuminating just yet. And you know what? I’m fine with that frankly. In one line: A visual spectacle to behold, inciting references in many classic works and still being distinctly it’s own thing. Before we start, I have to get one thing out of the way first. I didn’t mention this in my first episode write-up but 2 episodes in a row is too much. The robot has got to stop. His arms grabbing Kokona and Papika in the first episode was very uncomfortable, and he was at it again this episode lifting skirts. Stop it. It’s not funny. It’s that happy but kind of weird combination, among other things, that have made many to make connections between Flip Flappers and fairy tales, specifically the Brothers Grimm ones. While the Disney versions of these famous tales have removed a lot of the darkness within, the original versions were often very violent and [pun intended] grim. I don’t imagine this show will get quite as dark as some of these early fairy tales, but I do expect some pretty unsettling revelations to come. The ED, while super stylized and just as visually interesting as the rest of the show, evokes memories of one of the Brothers Grimm fairy tales, “Hansel and Gretel”. And this episode, we go down the rabbit hole into another fairy tale-esque story, Charles Dicken’s “Alice in Wonderland”. Kokona and Papika’s chase after Uexkull leads them into another strange abstract world that is quickly becoming director Kiyotaka Oshiyama’s specialty. Seriously, there are few things this season as cool as the worlds that Oshiyama is designing and bringing to us on a weekly basis and I can’t get enough of them. (As a side note, did you notice the statue of the Thinker that hid the entrance to this other world they got sucked into? In classical literature, the Thinker is often thought to be in front of the Gates of Hell. Hmmmm) Not only that, but the transformations of Papika, Kokona and the suddenly manly Uexkull are just great. In a reversing of the situation in episode 1, it’s now rabbit-Papika’s turn to save rabbit-Kokona and no-longer-rabbit-Uexkull from certain doom. Both girls have had a magical girl transformation but not what I assume is the transformation just yet. That will probably be saved for later. Finally, when we return we finally find out what the name Flip Flappers comes from as Flip Flap is the organization behind Papika. She seems oblivious, but it’s pretty obvious to both Kokona and to us the viewers that these people aren’t completely trustworthy. And well, when Papika opens the episode explaining that the fragments they are collecting grant wishes, we can probably see the problem here. It’s only a matter of time until Dr. Salt and his glasses henchman reveal their true, ulterior motives. Whatever “Liberating Pure Illusion” means, it’s probably not good. In one line: Another episode, another cool world, another magical girl transformation, and another look at one probably evil organization. One of a bevy of original magical girls shows this season, Flip Flappers is the show I immediately took a liking to. Studio 3Hz is the one bringing this to us, who last brought to us Dimension W from the Winter season earlier this year. And while that show had its fair share of writing problems, one thing it didn’t lack was stellar animation and Flip Flappers is continuing that trend in this earlier going. The instances of Papika and Kokona flying around in Pure Illusion and the ultimate sequence with the frosted trees are incredibly well done. While they’re fitting the archetypes of many a magical girl show before them, their dynamic is still fun enough to not feel repetitive. I also noted that certain visual effects felt almost Dandy-esque, particularly the action sequence towards the end and what I can best describe are the droplet effects. And lo and behold, our director here, Kiyotaka Oshiyama, directed a number of episodes for both seasons of Space Dandy. Including one of the more visually interesting episodes of that series, “Plants are Living Things Too, Baby” so I expect the visuals to continue their impressive performance throughout the run. The art is also a spectacle to watch. While Kokona’s hometown is fairly standard, the details make it much more accessible to us, but it’s once we get into Pure Illusion that it really takes off. Winter Wonderlands are beloved across many mediums because of the sense of wonder, and open space that leads our more childish impulses to explore. Flip Flappers captures that while also not making the design as simplistic as it could have been. It also has to be said that exposition is often an achilles heel of many anime series. Many times, a main character or someone else will spend opening episodes spouting the state of the world and/or the “important things” that the viewers need to know. And yet this can and frequently does come across as lazy storytelling and flawed world-building. Flip Flappers does the opposite. It tells us nothing about Pure Illusion and so we’re supposed to infer everything that’s happening from the visuals alone, allowing the viewer to try and fill in the blanks with his or her own imagination. Does it matter what Pure Illusion is, or how they got there or what they’re supposed to be doing yet? Maybe it will, but the show is confident enough that it doesn’t need to hand hold the viewer through these explanations just yet. And it definitely succeeds there. Part of why is because underneath the fun escapade that Kokona and Papika take us through during the episode, are hints both blatant and subtle that something darker is going on here. Whether it’s Kokona’s dream, Papika leaving a prone body in the lab during her escape, or the fact that TT-392 apparently has a human brain, Flip Flappers keeps dropping these bread crumbs without any overt explanation. The overall effect is that we again, whether consciously or unconsciously, are being drawn in desiring to learn more about what is exactly going on. In a less confident show, all of this could have been perceived as flat and conventional as there isn’t anything new about the bare bones of the story structure so far. And that’s what I keep coming back to. Yes, this is your traditional magical girl show at heart. Shy girl with little direction finds boundless energy girl and goes on adventures, all the while learning to appreciate the little things in life, and nearly always the importance of friendship. But the complete lack of detail allows us to sink our teeth into the world via the art, animation and our characters. The story grows organically without beating our heads with the tropes that are often found in these shows, and keeps the also-common mysteries subdued and artful. Flip Flappers is one to watch, and if it keeps this up should be on many “Best of Fall” and maybe even “Best of 2016" lists if we’re lucky. In one line: Simultaneously a loud and quiet start, Flip Flappers has set itself up with one of the strongest opening episodes of the season. 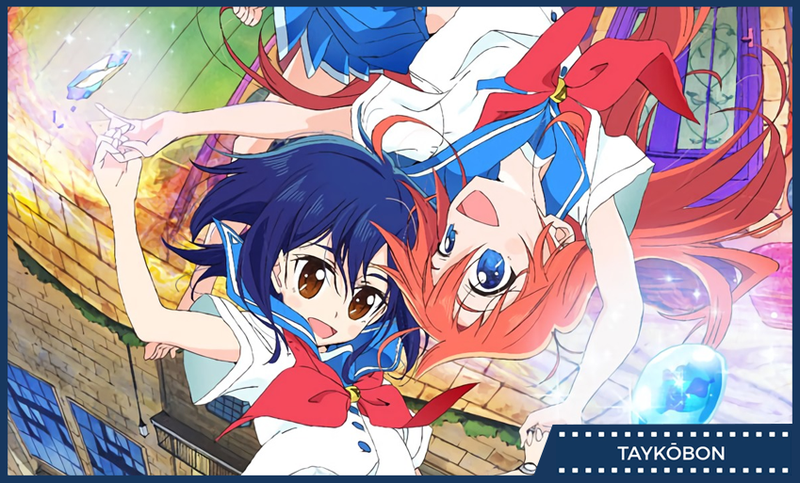 Flip Flappers is being produced by Studio 3Hz and airing during the Fall season. A complete original, it is being directed by Kiyotaka Oshiyama (Mostly a key animator, but a director of several Space Dandy episodes). You can surf along with Kokona and Papika on both Crunchyroll and The Anime Network in the US.